Aspired to Immigrate to the Canada inevitably required certain criteria to meet; like the English language standards, quality working experience and few more. Keeping this in consideration Canada government is making ease for lower qualified and low language proficient skilled candidates; Canada has introduced (AIPP) Atlantic Immigration Pilot Program the new system to immigrate to Canada, the immigration department of Canada main objective is to attract the greater amount of low skilled foreign workers from 2017. AIPP is concentrating on a particular set of category candidates, accepting the applications from international students and graduates having no working experience and completed their graduation from Canada and also welcoming the International candidates having low language skills and basic education standards. This program is very feasible for all types of Immigrants, not only favoring to basic level applicants but also skilled professionals workers can immigrate to Canada through this program. 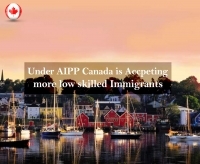 In 2017 under this AIPP program is planning to approve 2000 Immigrants through Canada Permanent Residency and this program includes the states like Nova Scotia, Prince Edward Island and Newfoundland and Labroador.